In other “Dave’s Creative Pursuits” news, the story I wrote with my friend Tobias Buckell, “Rules of Enchantment,” is out today. 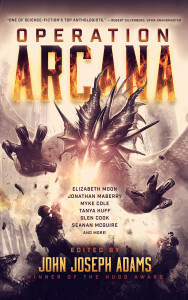 The story is appearing in the John Joseph Adams anthology, Operation Arcana, published by Baen. You can check out your buying options here. As happens when Tobias and I sit down to write a story, we had a hell of a lot of fun, and once again we leveraged my military experience pretty heavily. (Not that I ever did anything quite like what happens in the story, natch.) This makes the fourth story I’ve written with him, and the second that JJA has bought from us. At some point, I think there will be a free online version somewhere, but I haven’t heard exactly where that’s going to be. (The last time it was at io9.com, but I don’t know if that’s how this is going again.) So in the meantime, go on, buy it, enjoy it, and tell all your friends! I had a pretty good weekend–it’s the middle three performances of the play I’m in, with the last three coming next weekend. Had a nice time after each one hanging out with some of the folks from the cast and crew. (Me and one other person are in the running for making it to each after-show gathering.) At one, spent a lot of time discussing science fiction and fantasy books and reading and such, and it was a strange relief to be talking about it with someone who is just a reader–not in the industry, no aspirations to be a writer, no real strong opinions on the health of the genre or anything like that. Just… a reader. As I mentioned before, I can be really sensitive to hype and over-discussion, and that was just the antidote I needed. The longer I go into the run of this show, the more I’m convinced that this one of the best decisions I could have made. Now, I won’t be performing in the next show, but I am going to be helping out, and I’ve volunteered to get more involved in the actual running of the theatre as a whole. So I’m hoping that by keeping my hand in I can kind of expand my social circle and cement myself a little more into this particular community. Copyright © 2019 David Klecha All Rights Reserved.